James “Red” Holloway, a world-famous blues and jazz saxophonist and long-time resident of Cambria, died on Feb. 25. He was 84. SAX SYMBOL : Cambria resident Red Holloway, perhaps the Central Coast’s best-known jazz and blues saxophonist, died Feb. 25. His manager, Linda Knipe, told New Times that Holloway passed away at the Bayside Care Center in Morro Bay around 5:30 a.m., after experiencing kidney failure and other complications brought on by several strokes. 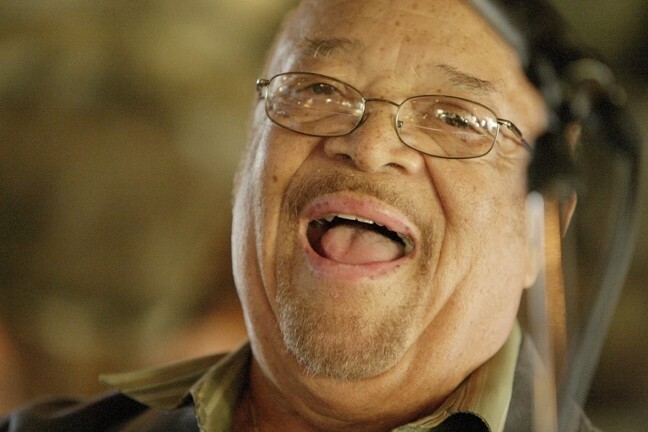 A highly regarded master of his craft, Holloway was known in clubs throughout Los Angeles, Chicago, and New York as the steady sideman, blowing hearty, bluesy blasts on tenor, and soulful screams and swoons on alto. But around the North County coastal community he called his home for about a quarter-century, Holloway was known simply as Red. When he wasn’t off touring—as he did a majority of the year—he could be found playing music with friends at Cuesta College, the Inn at Morro Bay, and the Hamlet at Moonstone Gardens. Born in 1927, Holloway built a name for himself with his work in the emerging electric rhythm-and-blues scene in Chicago in the late ’40s. His résumé as sideman and session player in the Windy City reads like the Who’s Who of Blues: Muddy Waters, Willie Dixon, John Mayall, Chuck Berry, Bobby Bland, B.B. King, Billie Holiday, and Lester Young. By the late ’60s, the versatile Holloway turned his talents to jazz, as many blues acts had begun to favor harmonicas over the saxophone. As a jazzman, Holloway traveled and played extensively with the likes of Dexter Gordon, Jack McDuff, George Benson, Lionel Hampton, Sonny Rollins and Etta James. He bought a house in Cambria in 1985 after discovering the town on a return trip to Los Angeles following an appearance at the Monterey Jazz Festival. He most recently acted as grand marshal in the 2011 Pinedorado Parade. Knipe said Red’s funeral is scheduled for 9 a.m. on March 4 at the Church of the Hills, Forrest Lawn, in Los Angeles. However, Knipe said a celebration of Holloway’s life will be held within the next month in Cambria. Details will be available soon.